Every August we head to Iles de la Madeleine (The Mags) for a week of uninterrupted windsurfing. The road trip has become a family tradition as Sean, Charlie and I squeeze into the Matrix amongst the windsurfing gear, bikes, coolers and clothes for a full day of travel to these Quebec islands located 134 kilometres off the coast of PEI. We’ve taken to referring to this trip as Charlie’s vacation because of the enjoyment he gets from experiencing the island’s miles of secluded beaches, and trails that weave through mountain-sized dunes. In fact, Charlie’s pretty near bilingual now thanks to our annual Mags vacation. When he’s not exploring the island’s coastline, he’s bumming lunch from the Quebec windsurfers, dutifully obeying their French commands for barbecued wieners. Charlie’s vacation adventure starts with a road trip to PEI where he spends the night at the luxurious three-star Cornwall Super 8. This hotel, like many, are more than happy to accommodate your four-legged family member for an extra cleaning fee of $10. While his humans enjoy a night out at their favourite Charlottetown pub, Charlie spends the evening lounging on his own double bed with a new knuckle bone that provides hours of enjoyment and takes his mind off of any unfamiliar noises. The next morning, we head to Souris, PEI to catch the five-hour ferry ride to The Mags. Before we take our spot in the ferry line-up, we make a detour to a small secluded beach where Charlie stretches his legs. His Beagleness overrides his Labness when it comes to swimming, so he only puts his toes in the water. The ferry ride to The Mags is an adventure in itself. Filled with mostly laid-back Quebecers and their chiens, Charlie makes some new buddies while we enjoy some live Acadian music. On the island, Charlie checks into his one bedroom, dog-friendly cottage that overlooks the sound and backs onto “Sur Beach”. After making friends with the neighbours, Charlie is off on his first hike through the dunes and onto the 30 mile beach. He chases rocks, rolls in dead-stuff, and digs holes in the sand. His next six days are filled with the same beach adventures and his evenings with beach bon fires, walks in the nearby historical town of La Grave and watching sunsets from the cottage’s small deck. On day seven, we re-pack the Matrix, head to the ferry and bid a sad farewell to our favourite dog-friendly island. 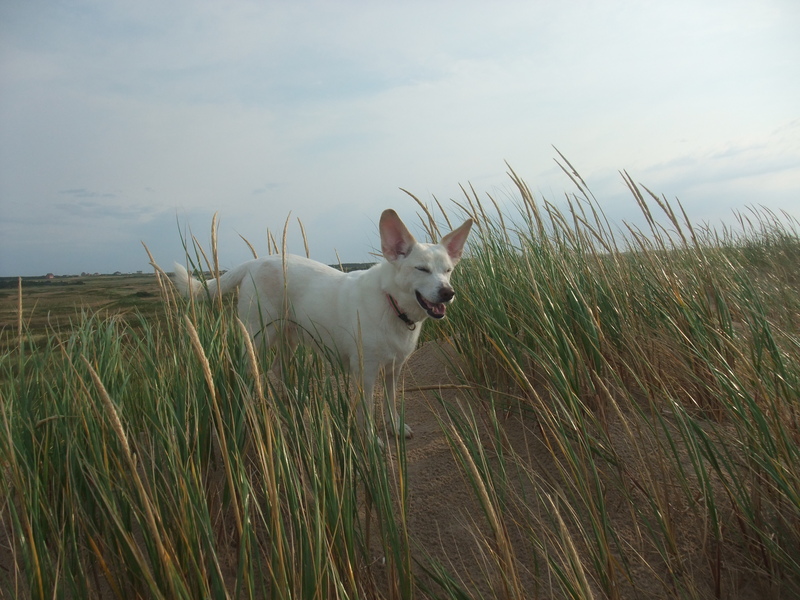 We’ve contemplated changing up our summer vacation, but for us the “anything goes” nature of the French islanders, the vast beaches and the strong winds that make Charlie’s Beagle ears stand at attention cannot be found anywhere else but on the Iles de la Madeleine.